Living and working in space for extended periods of time is hard work. Not only do the effects of weightless take a physical toll, but conducting spacewalks is a challenge in itself. During a spacewalk, astronauts can become disoriented, confused and nauseous, which makes getting home difficult. And while spacewalks have been conducted for decades, they are particularly important aboard the International Space Station (ISS). Hence why the Charles Stark Draper Laboratory (aka. Draper Inc.), a Massachusetts-based non-profit research and development company, is designing a new spacesuit with support from NASA. In addition to gyroscopes, autonomous systems and other cutting-edge technology, this next-generation spacesuit will feature a “Take Me Home” button that will remove a lot of the confusion and guesswork from spacewalks. Spacewalks, otherwise known as “Extra-Vehicular Activity” (EVA), are an integral part of space travel and space exploration. Aboard the ISS, spacewalks usually last between five and eight hours, depending on the nature of the work being performed. During a spacewalk, astronauts use tethers to remain fixed to the station and keep their tools from floating away. Another safety feature that comes into play is the Simplified Aid for EVA Rescue (SAFER), a device that is worn by astronauts like a backpack. This device relies on jet thrusters that are controlled by a small joystick to allow astronauts to move around in space in the event that they become untethered and float away. This device was used extensively during the construction of the ISS, which involved over 150 spacewalks. However, even with a SAFER on, it is not difficult for an astronaut to become disoriented during and EVA and lose their bearings. Or as Draper engineer Kevin Duda indicated in a Draper press statement, “Without a fail-proof way to return to the spacecraft, an astronaut is at risk of the worst-case scenario: lost in space.” As a space systems engineer, Duda has studied astronauts and their habitat on board the International Space Station for some time. In one configuration, the system will control the crew member’s SAFER pack and follow a prescribed trajectory back to a location designated as “home”. In another, the system will provide directions in the form of visual, auditory or tactile cues to direct the crew member back to their starting point. The crew member will be able to activate the system themselves, but a remote operator will also be able to turn it on if need be. According to Séamus Tuohy, Draper’s director of space systems, this type of return-home technology is an advance in spacesuit technology that is long overdue. “The current spacesuit features no automatic navigation solution—it is purely manual—and that could present a challenge to our astronauts if they are in an emergency,” he said. The solutions, as far as Duda and his colleagues are concerned, is to equip future spacesuits with sensors that can monitor the wearer’s movement, acceleration, and relative position to a fixed object. According to the patent, this would likely be an accompanying orbiting spacecraft. The navigation, guidance and control modules will also be programmed to accommodate various scenarios, ranging from GPS to vision-aided navigation or star tracking. Draper has also developed proprietary software for the system that fuses data from vision-based and inertial navigation systems. The system will further benefit from the company’s extensive work in wearable technology, which also has extensive commercial applications. By developing spacesuits that allow the wearer to obtain more data from their surroundings, they are effectively bringing augmented reality technology into space. Beyond space exploration, the company also foresees applications for their navigation system here at home. These include first responders and firefighters who have to navigate through smoke-filled rooms, skydivers falling towards the Earth, and scuba divers who might become disoriented in deep water. Literally any situation where life and death may depend on not getting lost could benefit from this technology. Every year, NASA showcases how the technology it develops for exploring space and studying other worlds has applications here on planet Earth. It’s what known as Spinoff, an annual publication that NASA’s Technology Transfer Program has been putting out since 1976. Since that time, they have showcased over 2000 examples where NASA technology was used for the sake of creating products that had wide-ranging benefits. For Spinoff 2017, NASA selected 50 different companies that are using NASA technology – which included innovations developed by NASA, those made with the help of NASA funding, or those produced under contract with the agency. With examples ranging from GPS and satellite imaging, to light detection and ranging (Lidar) and biomedical devices, the list of commercial applications for this year is quite impressive! For over 50 years, the NASA Technology Transfer Program has share NASA resources with private industries, a process which is colloquially referred to as “spin-offs”. In finding the widest possible applications for NASA technology and leveraging partnerships and licensing agreements with industry, they ensure that the large investments made in space exploration find additional uses that benefit humanity here on Earth. “Spinoff is NASA’s annual publication featuring technologies that have left NASA’s launchpads and laboratories and moved into the public sector. We’ve published Spinoff each year since 1976, featuring about 50 of the best examples of commercialized NASA technologies each year. These range from consumer goods to public safety and medical equipment to advances in round and aire transportation. This year’s spinoffs were certainly numerous, but some are particularly worthy of mention. For instance, there is the metal oxide semiconductor (CMOS) image sensor that was developed by NASA’s Jet Propulsion Laboratory. Since its creation, it has become one of NASA’s most ubiquitous technologies, leading to the development of DSLR cameras, camera phones, and digital cameras that are available on every handheld device on the market. And then there’s the GPS technology NASA began developing back in the 1990s, which included software capable of correcting for GPS signal errors and enabling incredible accuracy. John Deere recently acquired this technology and used it to develop a popular class of self-driving farm tractors. Today, as much as 70% of North American farmland is cultivated by self-driving tractors that rely on this technology. And then there is the spinoff involving NASA-developed laser imaging and ranging technology (Lidar). This technology allowed the Pheonix Lander to detect snow falling from the skies of Mars, and will be used to OSIRIS-REx mission to land on an asteroid in the coming decade. And recently, this same technology was used by a team of archaeologists to map prehistoric sites in North America where hunter-gatherers hunted bison en masse. In addition, “Robotics Spinoffs” get a special mention in this year’s report, with homage being paid to missions like Curiosity and Juno (which have explored the surfaces and atmospheres of other planets) and space-based observatories like Spitzer, Chandra and Hubble – which have looked deep into the cosmic field. The technologies used by these missions has also had an impact in virtually every sector of the world’s economy. The publication also includes a section called “Spinoffs of Tomorrow“, which highlights 20 technologies that are especially well-suited for commercial adaptation. These include thin-film piezoelectric and composite materials that could be used in wind turbines to generate more electricity and improve electrode durability, as well as in personal devices to generate power from mere movement. There’s also the new Armstrong wing design that lower drags, which could make airplanes and wind turbines more efficient. The Glenn Research Center is also cited for their development of a suite of materials and methods that optimize the performance of nanomaterials by making them tougher, more resistant, and easier to process. This could be used to build super-resilient fabrics and consumer products. Then there’s an underwater vehicle developed by JPL that uses thermally-generated changes in buoyancy to generate electricity and recharge its batteries. This technology, which enables submarines to remain underwater for years at a time, could lead to the creation of nearly self-sufficient undersea drones – something that has applications in everything from sea exploration to pipeline monitoring. The section also makes mention of an easy-to-use device that separates DNA, RNA, and proteins outside a traditional lab environment. Originally intended for use aboard the ISS, this device could be a boon for developing nations where medical infrastructure may be limited. And there’s also a system that autonomously detects faulty wiring and reroutes around it. As always, the development of cutting-edge technologies can have applications that go far beyond the purpose for which they were originally intended. Whether it is robotic landers or probes, miniaturized cameras, improved electronics, or advanced materials, commercial industries here on Earth have always benefited from the research, development and exploration efforts of the space industry. CAPE CANAVERAL AIR FORCE STATION – Despite howling winds and unseasonably frigid temperatures in the ‘sunshine state’, United Launch Alliance’s workhorse Atlas V rocket successfully blasted off this morning, Friday, Feb 5, and delivered the final GPS satellite in the IIF series to orbit for the US Air Force. CAPE CANAVERAL AIR FORCE STATION – The first launch of 2016 from Cape Canaveral, Florida, is poised for blastoff on Friday, Feb. 5, and features a United Launch Alliance Atlas V rocket carrying a US Air Force payload that will fortify the GPS constellation of navigation satellites that is critically important to military and civilian users on a 24/7 basis. United Launch Alliance (ULA) has decided to skip the bidding competition for launch of the next generation U.S. Air Force GPS military navigation satellites, a company spokesperson confirmed to Universe Today, meaning that rival SpaceX is set to win its first military launch contract as the only other certified contract contender. You know the old saying: “if you want to hide something, put it in plain sight?” Well, according to a new proposal by two professors of physics, this logic may be the reason why scientists have struggled for so long to find the mysterious mass that is believed to comprise 27% of the matter in the universe. In short, these two physicists believe that dark matter can be found the same way the you can find the fastest route to work: by consulting the Global Positioning System. Andrei Derevianko, of the University of Nevada, Reno, and Maxim Pospelov, of the University of Victoria and the Perimeter Institute for Theoretical Physics in Canada, proposed this method earlier this year at a series of renowned scientific conferences, where it met with general approval. Their idea calls for the use of GPS satellites and other atomic clock networks and comparing their times to look for discrepancies. 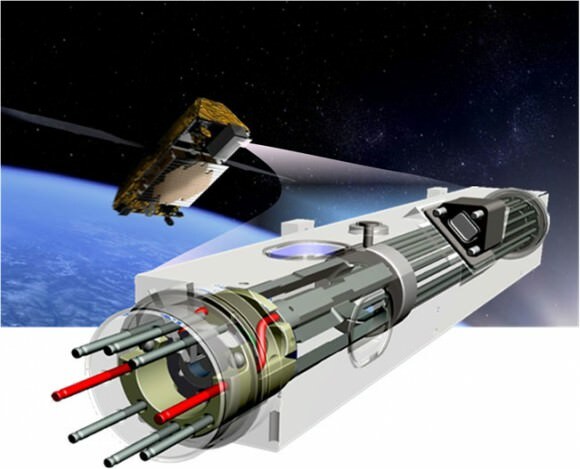 Derevianko and Pospelov suggest that dark matter could have a disruptive affect on atomic clocks, and that by looking at existing networks of atomic clocks it might be possible to spot pockets of dark matter by their distinctive signature. The two are starting to test this theory by analyzing clock data from the 30 GPS satellites, which use atomic clocks for everyday navigation. Correlated networks of atomic clocks, such as the GPS and some ground networks already in existence, can be used as a powerful tool to search for the topological defect dark matter where initially synchronized clocks will become desynchronized. Their proposal builds on the idea that dark matter could come from cracks in the universe’s quantum fields that could disturb such fundamental properties as the mass of an electron, and have an effect on the way we measure time. This represents a break from the more conventional view that dark matter consists of subatomic particles such as WIMPs and axions. Derevianko is collaborating on analyzing GPS data with Geoff Blewitt, director of the Nevada Geodetic Laboratory, also in the College of Science at the University of Nevada, Reno. The Geodetic Lab developed and maintains the largest GPS data processing center in the world, able to process information from about 12,000 stations around the globe continuously, 24/7. Blewitt, also a physicist, explained how an array of atomic clocks could possibly detect dark matter. 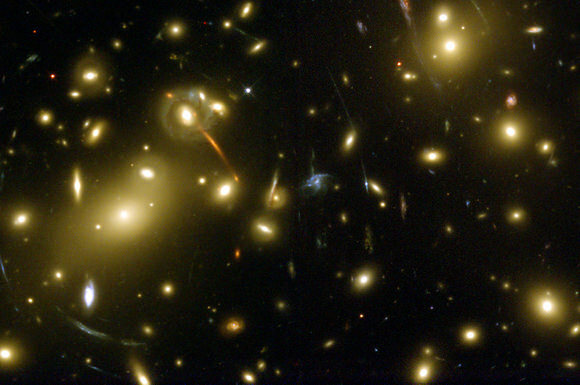 “We know the dark matter must be there, for example, because it is seen to bend light around galaxies, but we have no evidence as to what it might be made of,” he said. “If the dark matter were not there, the normal matter that we know about would not be sufficient to bend the light as much as it does. That’s just one of the ways scientists know there is a massive amount of dark matter somewhere out there in the galaxy. One possibility is that the dark matter in this gas might not be made out of particles like normal matter, but of macroscopic imperfections in the fabric of space-time. Derevianko teaches quantum physics and related subjects at the University of Nevada, Reno. He has authored more than 100 refereed publications in theoretical physics. He is a fellow of the American Physical Society, a Simons fellow in theoretical physics and a Fulbright scholar. Among a variety of research topics, he has contributed to the development of several novel classes of atomic clocks and precision tests of fundamental symmetries with atoms and molecules. Their research appeared earlier this week in the online version of the scientific journal Nature Physics, ahead of the print version. An independent investigation committee is looking at why two European navigation satellites are in the wrong orbits following their launch from French Guiana last week. While the first part of the launch went well, officials said telemetry from the satellites showed that the satellites were not where they were supposed to be. The probe is ongoing, but officials believe it is related to a stage of the Soyuz rocket that hefted the satellites into space. “According to the initial analyses, an anomaly is thought to have occurred during the flight phase involving the Fregat upper stage, causing the satellites to be injected into a noncompliant orbit,” wrote launch provider Arianespace in an update on Saturday (Aug. 23). The same day, the European Space Agency added that officials are looking into how the mission would be affected, if at all. The Galileo satellites, the fifth and sixth of the constellation, are intended to serve as part of a cloud of navigation satellites that would be a European alternative to the United States GPS system. Officials are hoping to launch six to eight more satellites per year until 2017, when 24 satellites and six backups will be ready for full service. The satellites were supposed to be in a circular orbit, inclined at 55 degrees to the Earth’s equator and have a maximum orbital radius (semi-major axis) of 29,900 km (18,579 miles). Telemetry now shows the satellites are in a non-circular orbit inclined at 49.8 degrees, with a semi-major axis of 26,200 km (16,280 miles).